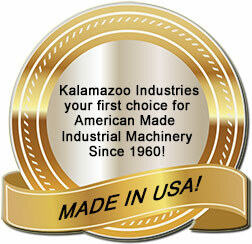 Kalamazoo Industries, Inc. manufactures abrasive cut-off saws, belt sanders, 5C fixtures and vibratory finishers here in Kalamazoo, Michigan since 1960. Most standard products can be modified to suit your specific needs. Special machines can also be made to your specifications. Sold through dealers nationwide . Contact us for your local dealer and representative . Let us know how we can help!